This book includes an overview of current physiological monitoring techniques and explains the fundamental technology used in remote non-contact monitoring methods. Basic radio wave propagation and radar principles are introduced along with the fundamentals of physiological motion and measurement. Specific design and implementation considerations for physiological monitoring radar systems are then discussed in detail. 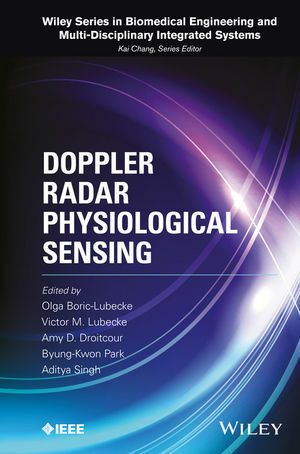 The authors address current research and commercial development of Doppler radar based physiological monitoring for healthcare and other applications. Doppler Radar Physiological Sensing serves as a fundamental reference for radar, biomedical, and microwave engineers as well as healthcare professionals interested in remote physiological monitoring methods. Olga Boric-Lubecke, PhD, is a Professor of Electrical Engineering at the University of Hawaii at Manoa, and an IEEE Fellow. She is widely recognized as a pioneer and leader in microwave radar technologies for non-contact cardiopulmonary monitoring, and in the design of integrated circuits for biomedical applications. Victor M. Lubecke, PhD, is a Professor of Electrical Engineering at the University of Hawaii at Manoa. He is an emeritus IEEE Distinguished Microwave Lecturer and has over 25 years of experience in research and development of devices and methods for radio-based remote sensing systems. Amy Droitcour, PhD, has spent ten years developing radar-based vital signs measurement technology through her dissertation research and leading product development as CTO of Kai Medical. She currently serves as Senior Vice President of R&D at Wave 80 Biosciences. Byung-Kwon-Park, PhD, is a senior research engineer at the Mechatronics R&D Center in Korea. Aditya Singh, PhD, is currently a postdoctoral researcher at the University of Hawaii Neuroscience and MRI research Program.